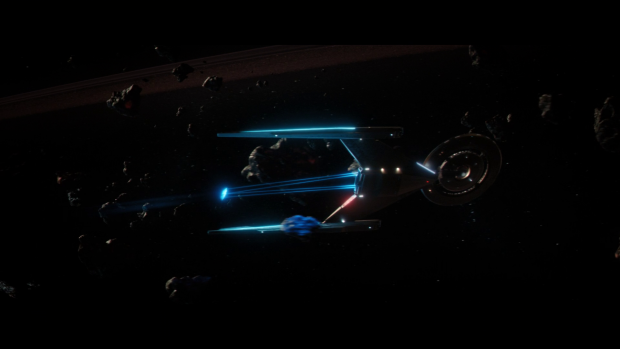 Star Trek Discovery continues to explore the mystery of the red bursts and takes the crew to an undiscovered Human colony on the other side of the galaxy. 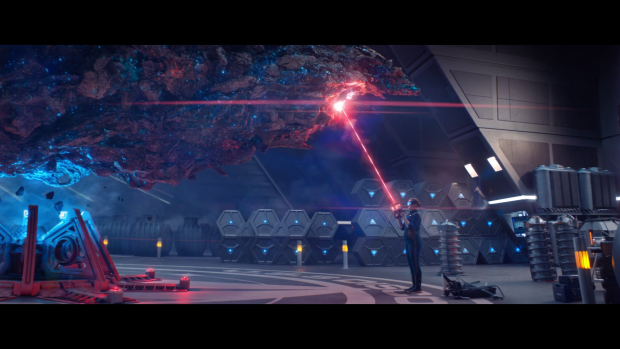 I mentioned last week that the red burst story could act as little more than an enabler for plot, acting as an excuse to take the ship and crew to various locations motivated by studying the appearance of a red burst only to stumble into a different problem. That’s exactly what happens here though there is opportunity to continue theorising on the nature of these bursts. Pike and Burnham -I’m still not sure whether to refer to her as Michael as Burnham so I’ll flip between the two until I decide what feels right- represent different sides of a point of view which provides natural setup for healthy debate. Burnham is very much on the side of science and sees the bursts as nothing more than random mysterious energy fluctuations where Pike is open to the idea that there’s an intelligence behind them. The discovery of a colony of Humans who have been transmitting a distress call for over 200 years leads him to suggest that they might have been brought to this location for reasons they don’t yet understand. He cites the Arthur C. Clark law “any sufficiently advanced technology is indistinguishable from magic” and its update for a post contact with aliens culture “any sufficiently advanced extraterrestrial intelligence is indistinguishable from God”. Pike’s instincts tell him that an intelligence is at work as he believes that these Humans must be on this planet for a reason. Pike and Burnham’s discussion makes them mouthpieces for the clear theme of science vs. religion which makes for an engaging throughline for the season to explore. Once the show starts digging into the meat of this I suspect that there will be some degree of separating fact from myth in order to get as close to objective truth as possible. Answering the question if why there are humans so far out becomes the basis for the main plot of the episode and harkens back to old school trek. This episode is definitely a clear statement that this season is committing to going back to what makes this franchise so beloved and it’s definitely great to see even if the execution isn’t quite where it needs to be. To my mind this show has done a good job of updating Star Trek for a new era of television but this episode felt frustratingly old school in some ways and didn’t quite deliver on the promise of a fascinating mystery as teased by Pike and Burnham’s discussion. A big problem is the Human colony. It just isn’t interesting enough to carry the story as the writers don’t put the work it to make the culture feel anything other than superficial. They are a group of Humans descended from those who survived World War III by being whisked across the galaxy by the Red Angel entity that Burnham saw a vision of last week. Out of fear they have rejected technology and built a society based on mutual cooperation. Come to think of it they’re a lot like the Ba’Ku from Star Trek: Insurrection, another trek property directed by Jonathan Frakes. This group of Humans have combined all religions among them into a single faith so that they can coexist peacefully. That actually makes for an inspiring message as it ties into the trek ethos of people overcoming adversity by coming together. It may not be an ethos that reflects the modern world but it’s great to see the classic idealism applied in such a way. All of this works on the surface and could have worked on a deeper level if effort had been made to explore the people within this society rather than having them be an annoyance that keeps the away team from investigating. They have no difficulty learning how the people found themselves on this planet as they are treated to an expositional blessing that tells them everything they need to do upon arrival. It’s a shortcut so that the episode can get on with other aspects of the plot but it robs the people of the planet any opportunity to stand out as being more than caricatures. The closest thing to a character among them is Jacob (Andrew Moodie), the one responsible for maintaining the distress call out of hope that Earth wasn’t destroyed and that Humans would eventually come to find them. He sees through their flimsy story right away and looks to convince the others. It’s fairly clumsy and the episode never really arrives at a position on whether these Humans deserve to know the truth or should be left to develop in their own way. Pike hides behind General Order One also known as the Prime Directive; it basically forbids interference in pre-warp cultures for those new to the franchise. Since these Humans were taken away prior to the invention of warp drive they fall under that directive and should be left alone according to Pike. The problem with the application of the Prime Directive in previous incarnations of trek is that it was treated like a Dogma that absolutely had to be followed at all costs rather than a guideline that won’t apply in all circumstances. Strict adherence to it stops interesting debate in its tracks as it does here meaning the intricacies of the situation never come to light. The situation in this episode reminded me of the Enterprise episode “North Star” -or “Faith of the Horse” as I like to call it-. In that episode an unknown Human colony is discovered and the crew of the Enterprise have to decide what to do with them. They were also abducted by aliens so qualified as a pre-warp civilisation. It was decided that being Human granted them the right to know the truth. This dis predate the Prime Directive but it was an interesting decision and was an argument this episode could have spent more time on. Ultimately the compromise is that Pike reveals himself to Jacob but asks him to keep it secret which turns out to be enough for him. The resolution feels too easy and neat with very little in the way of drama attached to it. Another thing this plot failed to do was take the opportunity to develop Owosekun (Oyin Oladejo) who was established as being raised by a Luddite culture so would easily blend in with the people here. She did show resourcefulness in key moments but there was no sense of who she was as a person. 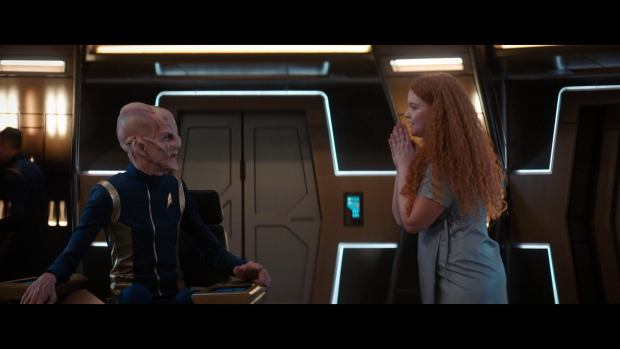 I would have liked to see a discussion on what made her leave to pursue a career in Starfleet and have her connect to the people on this planet in some way. Perhaps she could have helped them begin to accept technology as she did for example. Instead she’s basically a glorified extra. It’s a pity that the A plot was so problematic as the B plot was excellent. This is a common structure in this franchise as it gives the other characters something to do when the away team is investigating the planet. In this case they have to prevent an extinction level event that will be caused by radioactive particles from the rings. It’s a large scale crisis but the focus is more on the crew coming together to work the problem rather than focusing on the doom and gloom of the situation. Taking the lead is Tilly who is working injured after recklessly extracting a sample from the asteroid fragment scooped up last week. Her injury proves fortuitous as it teaches her about the gravitational properties of the asteroid. It can basically be used to attract the wayward fragments out of harm’s way. There’s a background implication that Discovery having exactly the thing needed to solve the problem that isn’t really addresses but it seems clear that an intelligence is leading them from place to place enabling them to solve problems. This could be how the Red Angel works though there’s not enough to speculate at this point. Tilly has a fellow officer to bounce ideas off but she turns out to be a hallucination inspired by someone in her childhood. Whether this is connected to the Red Angel remains to be seen but it’s certainly interesting. It could also have something to do with the Mycelial Network based on the spore that landed on her during the finale of last season. Either way it’s strange and compelling. A lot of people get to pull together to solve this problem with Stamets on the spore drive Tilly forming the plan, Detmer piloting the ship and Saru coordinating the plan calmly as a confident leader. It’s a lot of fun and shows the potential of these characters in a group situation. I defy anyone to not at least smile at the like “initiating doughnut manoeuvre“. It’s clear that Detmer loves this idea and it’s great to see the crew grinning as they get to sink their teeth into a problem. The new tone is working gangbusters and as with last week it’s refreshing to see expensive set pieces that don’t rely on combat proving that it isn’t needed to make something exciting. One thing I will cast concerns on is the spore drive coming back into the mix. There was always going to be a situation where Discovery is too far away to respond to something in time and will have to use it. As a one off this is fine but I feel that this won’t be the last of these one offs which undermines the idea of decommissioning it because of what needs to be done in order to operate it. The show needs to either commit to bringing it back into everyday operation -or at least resolve to use it when necessary- or scrap it altogether. To do otherwise would get ridiculous really quickly. 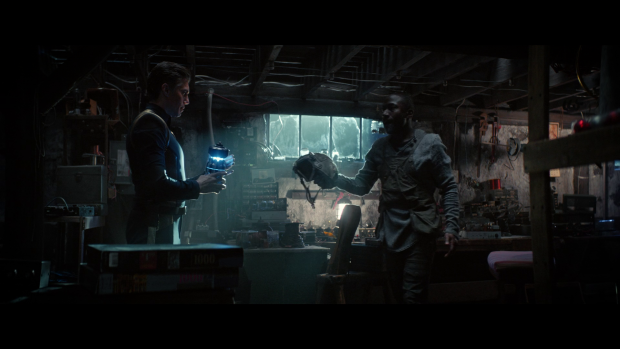 Tying the use of the drive to Stamets’ emotional state is a nice touch though as it creates a clear conflict between how he processes the loss of Culber and his responsibilities as well as adding meaning to the time they shared together in the Mycelial Network. No sign of Spock in this episode though his whereabouts are revealed. Pike talks about him being in a psychiatric unit which presents a problem as Burnham feels that contacting him will be futile so his connection to the Red Bursts will remain unexplained for now. The fact that he’s been dreaming about them since he was a child and the obvious friction between Spock and Burnham is fascinating. Burnham feeling comfortable enough to be open to Pike about personal issues. It’s really good to see these different dynamics compliment each other. An uneven episode that does a reasonable job of harkening back to classic trek and delivers so much fun in the B plot but fails to give the necessary depth to the A plot. The planet of displaced Humans was an interesting idea that set up a compelling debate between telling the truth and leaving them to develop on their own. There are definitely argument for both bit the dogmatic approach to the Prime Directive means that the debate barely sees the light of day. It ends with Pike coming clean to one person but it just feels like a cop out resolution that comes across as too neat. There was also a missed opportunity to develop Owosekun who has a compelling backstory but is little more than a capable extra. The debate between Pike and Burnham over science vs. faith is handled really well and underscores the main theme of the season. The B plot is far better handled with an excited crew coming together to solve a problem. Tilly takes the lead with her radical idea forming the basis for saving the day with the rest of the characters backing her up nicely. The excitement is infectious and it’s hard not to be charmed by Detmer’s “initiating doughnut manoeuvre” line. This is also yet more proof that set pieces can be exciting and dynamic without combat. The background implication that Discovery is being led from place to place by an intelligence in order to solve problems is fascinating and the possible connection to Tilly’s hallucinated friend adds more intrigue. Using the Spore Drive as an apparent one off is something that needs to be watched out for as continued use of this will be hard to justify unless the show arrives at a position on it that resolves the issue. Tying it to Stamets’ feelings about Culber’s death and his experience within the Mycelial Network is a nice touch that adds lots of weight to what he has been through.